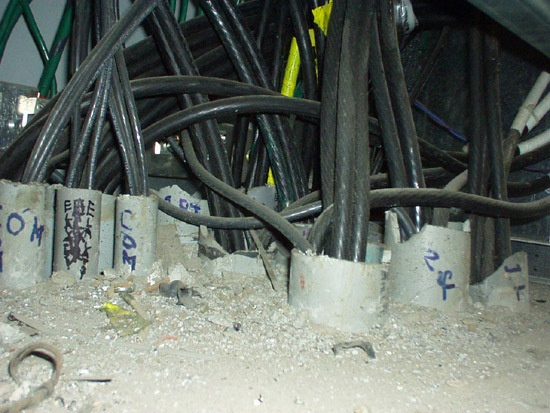 How do you terminate underfloor/underground conduits when they come up into an open bottomed enclosure. Obviously, I think this is not the best way. Most of the wholesalers I know don't even stock endbells, and it's a very rare thing to find them installed anywhere. I've always cut them about that height, but removed any burs and wouldnt leave the sharp edges like they did. I'll flip a coin if I put a coupling on the end. Some inspector might tag you for not protecting the wires I guess, but to me it would be a stretch, its PVC for goodness sake. Worst case, if you ever get tagged, put a PVC Box connector and then a plastic bushing. Have the PVC bushing protect the wires from the PVC pipe! But yes, the broken edges in that picture bug me. How about a plastic bushing on those raceways that contain conductors 4 AWG and larger? It is not a stretch, a bushing is required for PVC regardless of the conductor size. Where a conduit enters a box, fitting, or other enclosure, a bushing or adapter shall be provided to protect the wire from abrasion unless the box, fitting, or enclosure design provides equivalent protection. How about fitting a plastic or metal plate horizontally within the bottom of the enclosure and terminating the conduits with normal fittings through it? It would mean a lot more work, but it would certainly look neater. I always use a male adapter and plastic bushing when stubbing into gear or xfmrs. I always use end bells. It's also common to see people run branch conduits into hand holes by wrapping the whole bundle (riser) with duct tape. Fat chance you will get any kind of bushing on it after its back filled. I hear that comment all to often. I have to say that the code requirement seem superflous; isn't a pvc pipe 'equivalent' in protection to a pvc bushing? Indeed, isn't there mor often sign that the wire insulation abraded the pipe, rather than the reverse? If this is the worst violation found, I'd have to say "good job!" I don't see anywhere that it says "conduit"
Sharp edges can cut the insulation (ever cut yourself on PVC? It can be gory).